Yale Door and Window Solutions has launched a new online system dedicated to offering a convenient and secure key management solution. 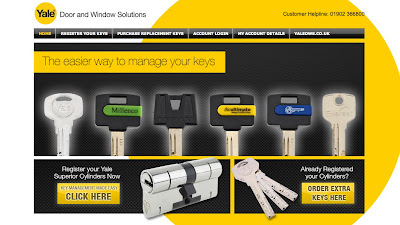 The new website, keyregistration.yaledws.co.uk, has been designed to offer an easy way to manage keys for homeowners and landlords, with simple navigation options to register and purchase replacement keys. In just three easy steps, visitors can confidentially register their Yale Superior keys together with their address details, enabling them to order additional keys when required. Replacement keys ordered on the site will only be delivered to the registered address, enhancing the security of the service. Online labelling of the keys during the registration process quickly identifies the location of the entry point for each cylinder in the home, further simplifying the ordering of replacement keys. Landlords have the option to enter multiple property addresses to ensure a convenient replacement key service is available for residents. Key cutting will be organised directly with Yale Door and Window Solutions, serving the most popular brands sharing this high security platform, including Yale Superior, Millenco Magnum, Ultimate and Tricept. “The web is now undoubtedly the first point of call for almost everyone, due to its ease of use and its accessibility at any time of day. This makes it ideal to host a key management system, designed to be visually led and easy to navigate.